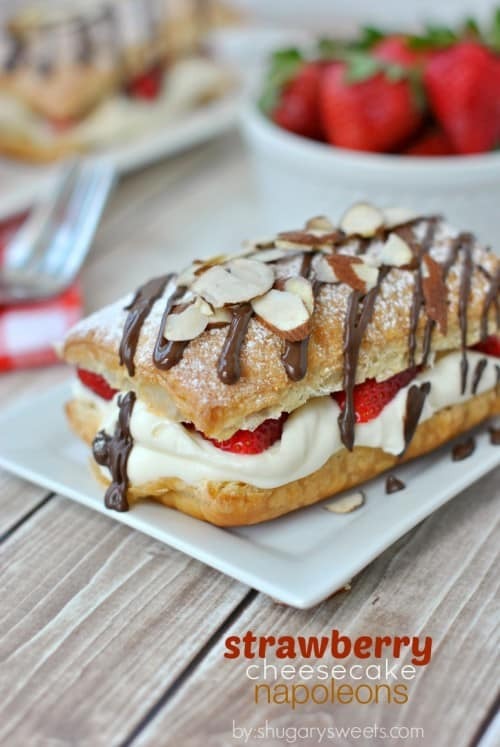 Sweet stacks of puff pastry, cheesecake, and strawberries are completed with some delicious sliced almonds! 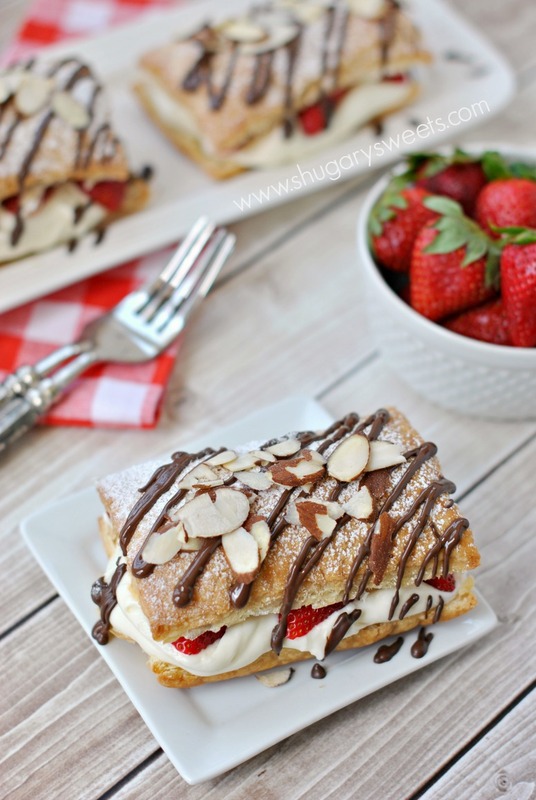 You’ll want to make these Strawberry Cheesecake Napoleons soon! Oh wait. Do I need to explain myself? Okay. Here it is. The man won’t eat anything creamy. Nothing with cream cheese, yogurt, sour cream, mayo. Basically, my favorite food group: “white goopy stuff”. Seriously, it’s maddening. No casseroles get consumed by him. He eats bread and butter while the rest of us devour a creamy, cheesy, goopy dinner. His ONE exception to the rule? Cheesecake. Dude, seriously, if goopy cream cheese offends you, how can you possibly love cheesecake? Especially his MOM’s no bake cheesecake. (which reminds me, I need to share that recipe soon!!). 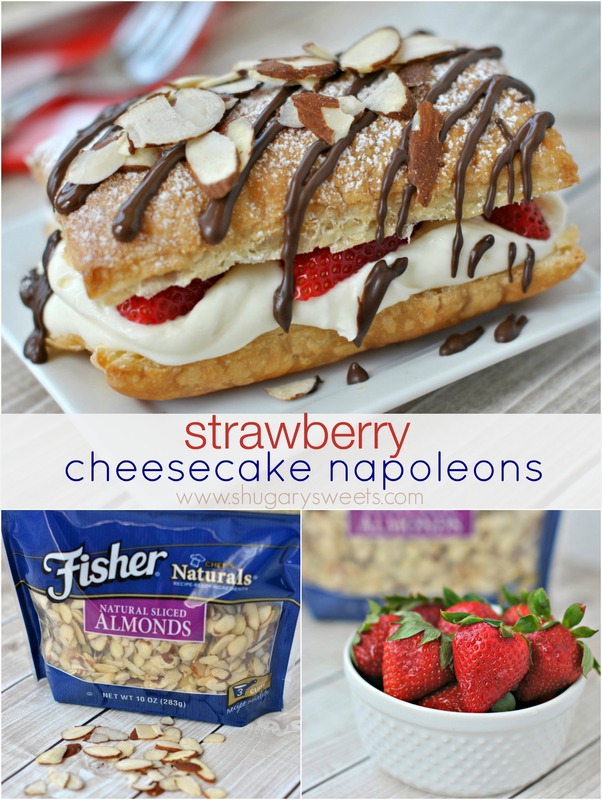 The filling of this Napoleon is based off his mother’s delicious no bake cheesecake recipe. It’s creamy. It’s goopy. It’s just how his momma makes it. And he loves momma’s cheesecake. Creating a spring recipe for Fisher’s was fun! 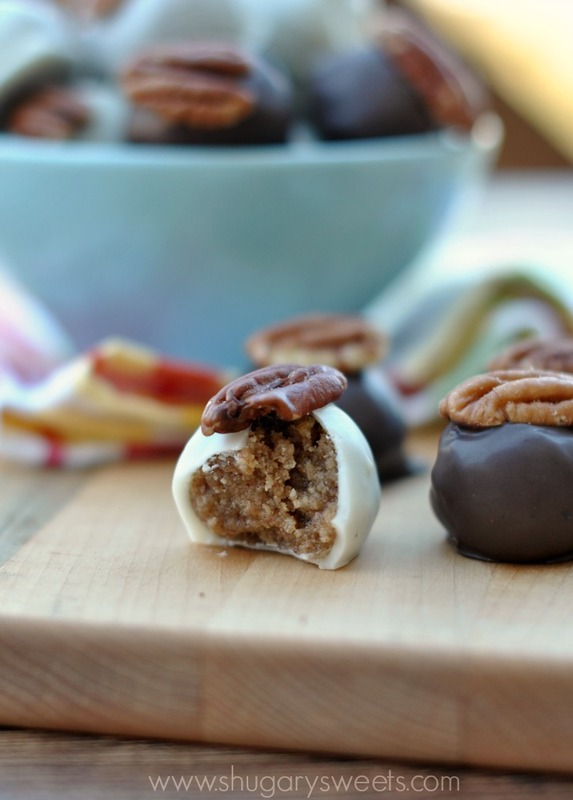 It only made sense to do an easy treat! Once you bake up the puff pastry, you can pile it high with creamy, fluffy no bake cheesecake filling. Add fresh berries (I used strawberries…but blueberries, raspberries and blackberries would be wonderful too)! 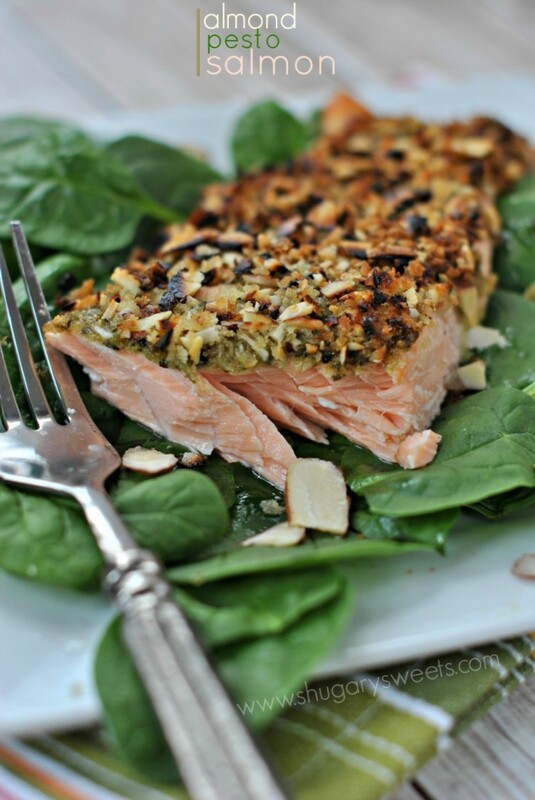 And of course, adding the Fisher’s Sliced Almonds on top was the perfect finishing touch. I love the crunch the almonds give to this dessert. Plus they make a simple treat look classy and elegant. Right? Classy and elegant, two things that do NOT describe me, haha! However, this dessert is perfect when entertaining family and friends this holiday! These are great when eaten immediately after assembling. But guess what? I did an experiment and allowed (yes, allowed, as in didn’t let anyone TOUCH it) one to sit overnight in the fridge. The result? It was still perfect. The puff pastry softened slightly, but the taste was absolutely yummy. 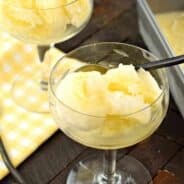 I hope you give this recipe a try next time you need a classy dessert but don’t want to slave away in the kitchen! Thaw puff pastry according to package directions. When ready to use, unfold and cut along seams, creating 3 long strips. Cut each strip in half, creating 6 rectangles. Place on a baking sheet and bake in a 400 degree oven for 11-15 minutes, until lightly browned. Remove and cool completely. Slice in half lengthwise through center. Set aside. In a large mixing bowl, beat cream cheese, sugar and heavy cream for 5 minutes, until fluffy. 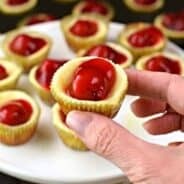 Fill bottom of each "sandwich" with cheesecake filling. Top with strawberries. Place top of puff pastry over strawberries and sprinkle (generously) with powdered sugar. Drizzle melted chocolate over each Napoleon and immediately sprinkle with Fisher's Sliced Almonds. Serve immediately or refrigerate. LOVE Fisher’s Nuts? 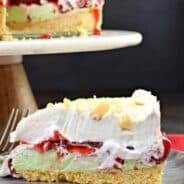 Here are a few of my past recipes created on their behalf! You are right…the man is crazy!!! Sorry Michael 😉 My hubby doesn’t do the mayo goop either, but I think the others are ok with him. This is definitely one fancy looking dessert, but I love how easy it is to put together. It’s perfect for those hot summer days that are coming! At least there is more dessert for the rest of you than. Cheesecake is a huge favorite in our house too. This dessert is all mine though. I would adore it. Yes, definitely more food for the rest of us!! The white goop food group is a staple in our house. At least he will eat cheesecake 🙂 Isn’t it funny what boys do for their momma! Pinned. I knew I loved ya Lisa!!! Thanks for pinning! I’m all about making sure I have everyone’s attention 🙂 Thanks for pinning Jenn!! I am so into this dessert! Cheesecake and strawberries? One of my favorites! I LOVE white goopy stuff…and so does my hubby…be he is still totally weird to me! This dessert is my life. Cheesecake, strawberries, buttery flaky goodness? I’m in! Lucky! I love that your hubs will eat goop, hehe!! All I can say is DO WHAT? LOL! He is missing out on so much goodness in life! I have a sister who doesn’t like cream cheese and won’t go near cheesecake. She doesn’t get invited over too much! Haha just kidding! He is most definitely missing out!! You crack me up about your sister, hehe. I won’t tell! 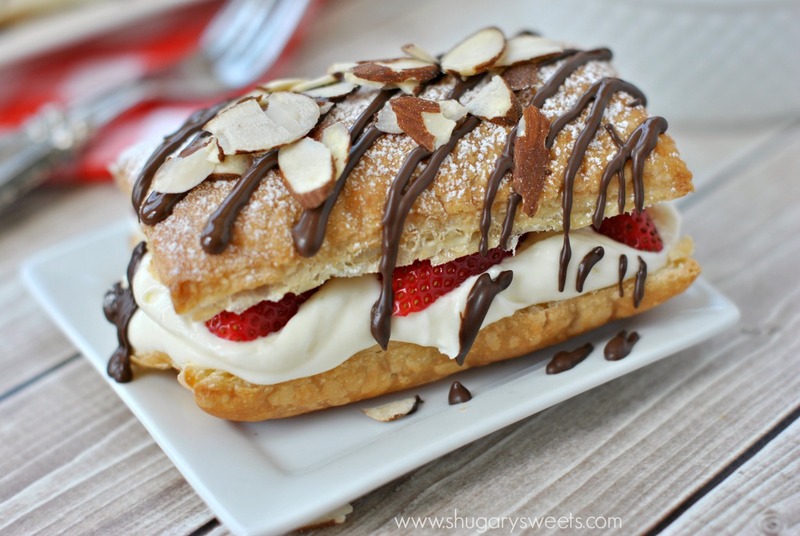 This is such a beautiful napoleon!! These napoleons are beautiful! Love love the cheesecake filling! 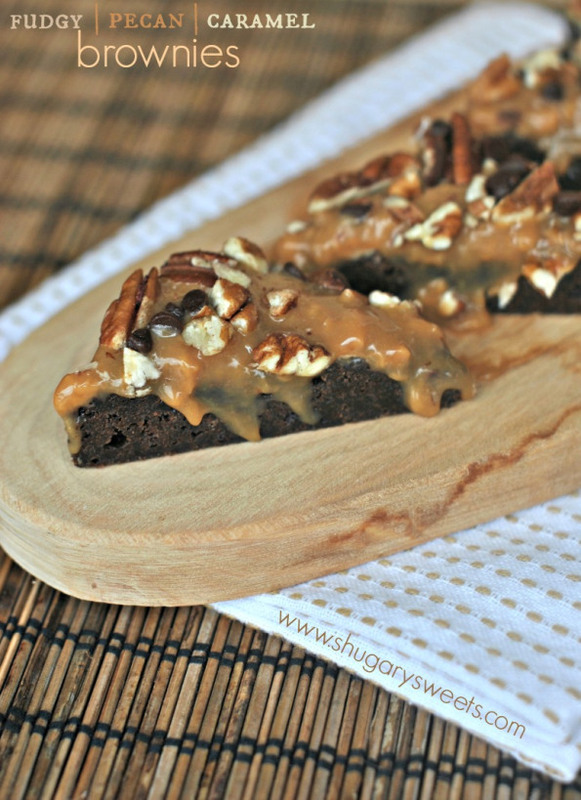 Love the layers of goodness this dessert has… it just screams eat me I’m delicious! White goopy stuff is my favorite food group too! It’s the best. And these are a dream come true! Want! Yes, who doesn’t like white goopy stuff?! I could lick it all day long!! This looks wonderful as usual! Even looking at the pictures makes me drool! 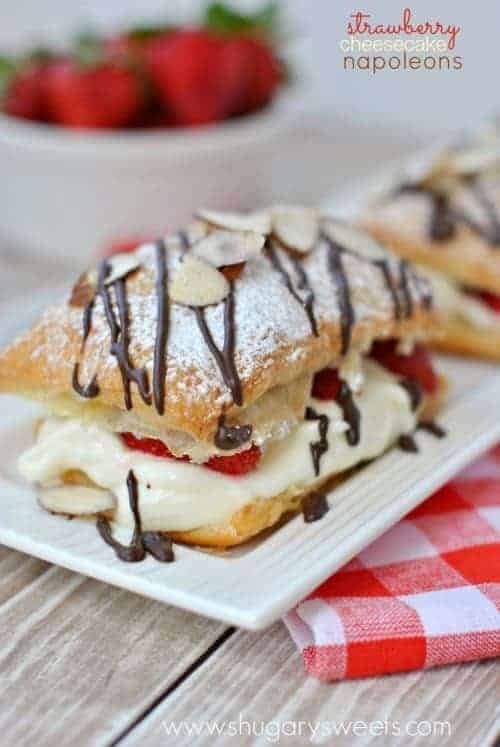 I’m all for desserts that don’t require slaving away in the kitchen 😉 This looks absolutely perfect!! I hear ya! Especially as the weather gets nicer, I want to be outside. Eating dessert! Thank you for pinning Averie!!! I totally want this for dessert! Delicious! YUM! I made napoloens this week too, SO good! Napoleons are my favorite!! I would eat 6 of these, literally no lie. My life revolves around creamy. I would stop to be concerned, but I’m too busy stuffing my face with these napoleons. 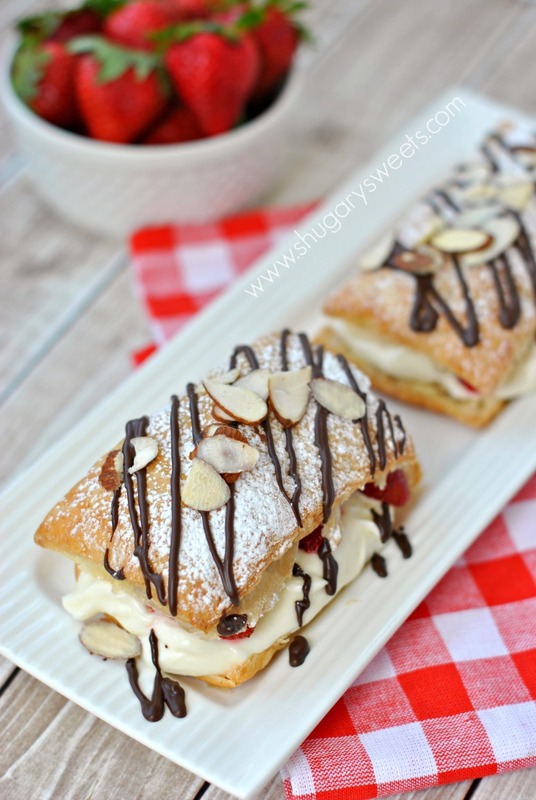 I’ve always loved the layers of napoleons and especially strawberries in this one! These napoleons are gorgeous! Love how easy they are! This looks amazing! It so beautiful, and I just can’t imagine how good it tastes. So gorgeous Aimee! Dessert perfection! And I love that filling – YUM! But. But. Creamy food is amazing. HOW CAN YOU SAY NO TO THE ENTIRE GROUP OF FOOD THAT IS CREAMY?! Agh. 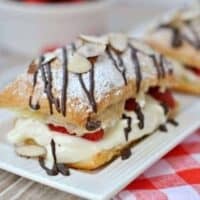 Well, at least cheesecake is an option, and these napoleons are gorgeous, Aimee! I know you all think I’m weird and my lovely wife’s talents are totally wasted on my, but in my defense (and in defense of us non-goopy people everywhere), I can trace back my roots of goopy aversion to the video below. Pingback: Brownie Bottom Cheesecake Bars - Chocolate Chocolate and More!